For nearly every legendary Bourbon there’s a backstory, and few bottles bear as much legend, lore and flavor as Old Fitzgerald Bottled-in-Bond Kentucky Straight Bourbon Whiskey. As our Spring 2018 release of this historic brand will prove, the story of "Old Fitz" contains more tales, truth and taste than ever. The first release of the aromatic and easy-sipping 100-proof Bourbon will be 11 years old and bottled in an ornate glass decanter. Released each spring and fall, every Old Fitzgerald edition will consist of about 100 barrels. To see the full history of the Old Fitzgerald brand scroll through our interactive timeline below. 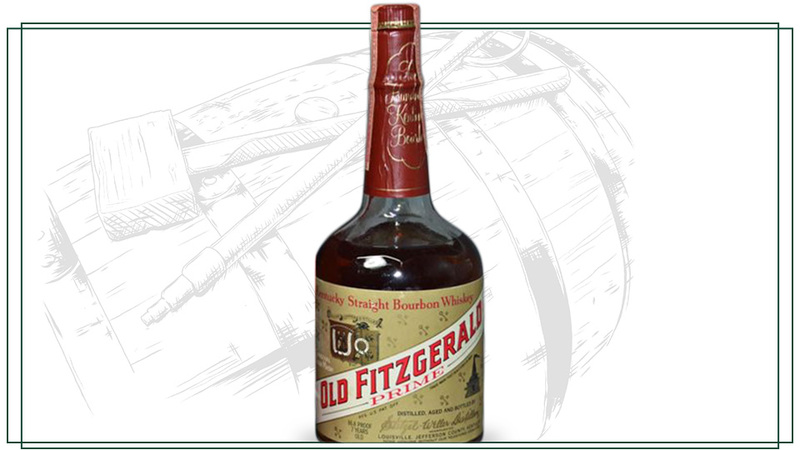 The story goes that in 1870, John E. Fitzgerald whiskey was a product named after a distiller working at Old Judge Distillery on Benson Creek, outside of Frankfort, Kentucky. Legend has it that he sold his product exclusively to private clubs, rail and steamship lines before renaming and trademarking it Old Fitzgerald in 1884. Official records show that in 1901, Solomon Charles "S.C." Herbst, a spirits distiller and distributor with businesses in Kentucky and Wisconsin, registered the Fitzgerald brand. 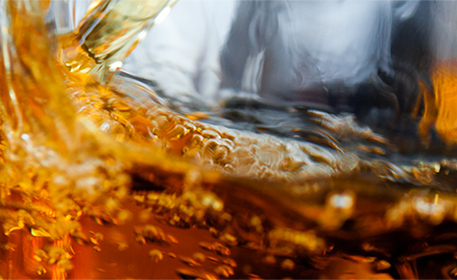 So successful was Herbst that he constructed a new bottling plant for the Bourbon in 1904. Two years later, legend claims he bought the Old Judge Distillery to continue making the product in copper pot stills. Fast forward 18 years to find Old Judge Distillery shut down due to Prohibition. Believing the Volstead Act would be repealed, W.L. 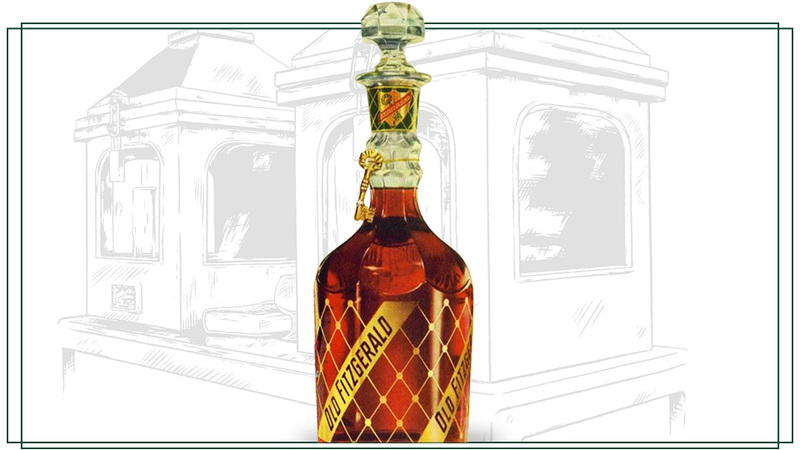 Weller, a whiskey marketing and distribution firm in Louisville, Kentucky, made the second of a pair of $2,000 payments to Herbst for the rights to the Old Fitzgerald name in 1925. Eight years later, when Prohibition ended, A. Ph. 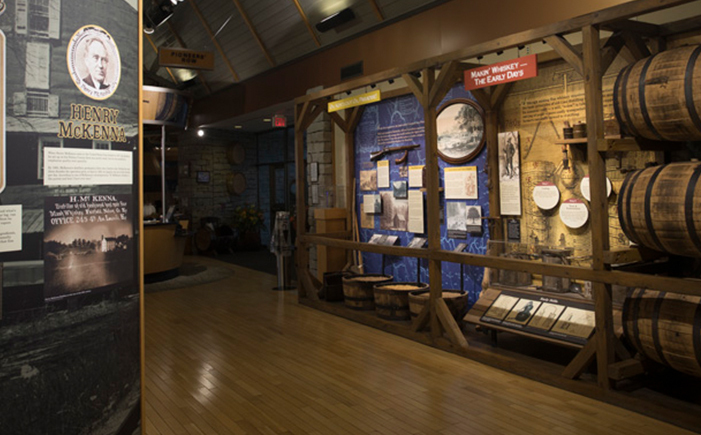 Stitzel Distillery—one of four distilleries permitted to make medicinal whiskey during that onerous dry spell—merged with Weller to form the Stitzel-Weller Distillery. 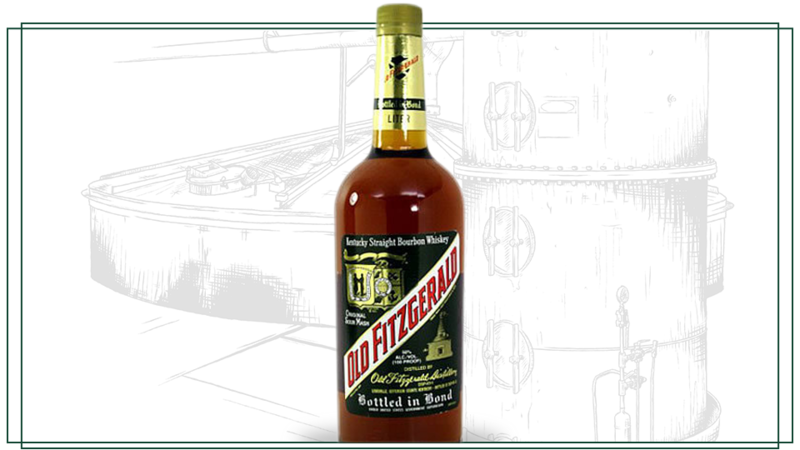 Under new ownership, some bottles of Old Fitzgerald were crudely relabeled by crossing out S.C. Herbst’s name and adding W.L. Weller and Sons’. 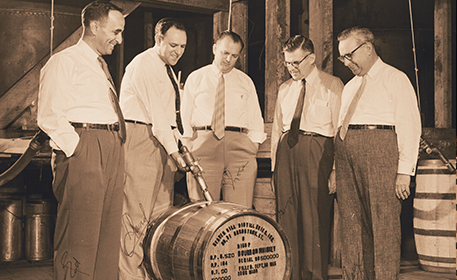 Energized by Prohibition’s repeal, Stitzel-Weller constructed a massive distillery in Shively, Kentucky, where it began making Old Fitzgerald in 1935. Knowing well the quality of Old Fitzgerald, a clever Weller marketer named Julian P. Van Winkle, leaned heavily on its backstory to sell it. Later known as "Pappy," Julian P. Van Winkle helped position Old Fitzgerald as a premium Bourbon known for exceptional softness created by using wheat in its grain mashbill. In 1951, the whiskey’s packaging was revised to match that high expectation. That year, the whiskey was packaged in an elegant, heavy glass "diamond decanter," the first of what would become multiple artistic decanters released over the next two decades (and the inspiration for the Old Fitzgerald Bottled-in-Bond Series decanter.) The whiskey would also experience several line extensions under the names Very Old Fitzgerald, Very Very Old Fitzgerald, and Old Fitzgerald Prime, the brand’s first non-Bottled-in-Bond release. 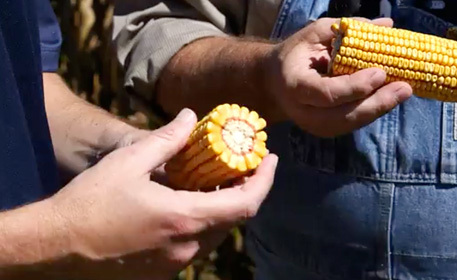 * The term Bottled-in-Bond is a purity and honesty declaration made by American whiskey distillers who distill and bottle a particular whiskey in one distilling season, at one distillery, and age it in a government "bonded" or supervised warehouse for no less than four years. Passed in 1897, the Bottled-In-Bond Act was a move by distillers to distinguish their products from adulterated spirits sold by rectifiers as Bourbon. 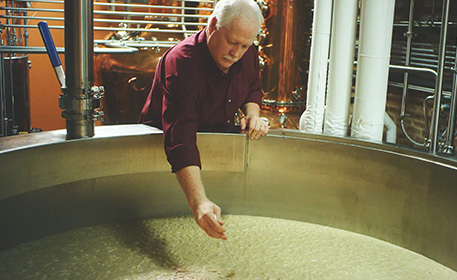 Years later after several changes in ownership, Heaven Hill bought the Old Fitzgerald brand in 1999 and began distilling it at its Bernheim Distillery in Louisville. And just in time, too, as the American whiskey rebirth was just beginning. Also in that same year, the publishing of Sally Van Winkle Campbell’s "But Always Fine Bourbon: Pappy Van Winkle and the Story of Old Fitzgerald" set the record straight. According to Van Winkle Campbell, Pappy’s granddaughter, Fitzgerald wasn’t a distiller at all. He was a U.S. Treasury Agent "gauger" charged with inspecting distilleries’ inventories to properly levy taxes. According to Campbell’s book, such a good inspector was ol’ Fitz that the many barrels subjected to his examinations were so noticeably lightened that bottling workers dubbed them "Fitzgerald barrels." Where such thefts took place remains foggy, though some accounts point to S.C. Herbst’s bottling operations in Milwaukee. 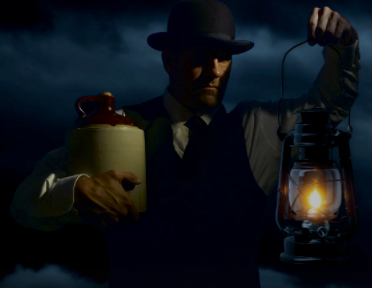 Regardless of the facts, the story remains one of the most beloved Bourbon industry legends, which led to the launch of Larceny Bourbon in 2012. Also using wheat in its mashbill, Larceny is a small batch Bourbon whose package utilizes a skeleton key as its symbolic logo element. 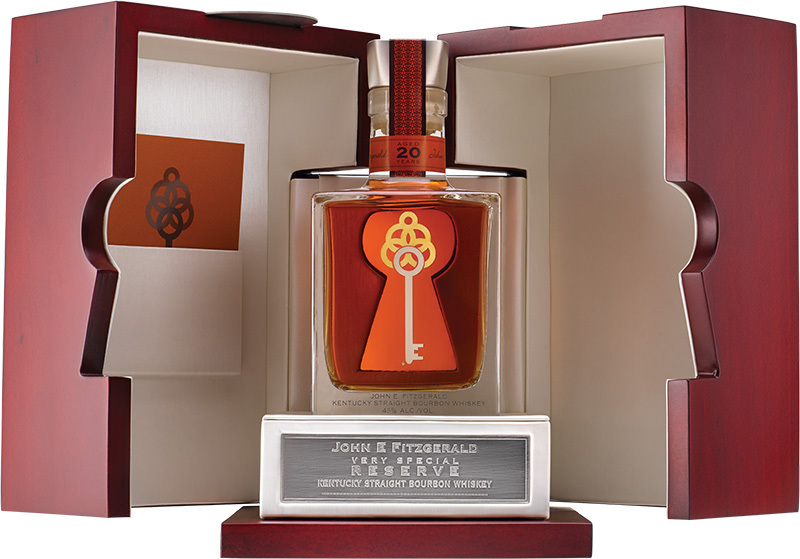 The key supports the brand story of Fitzgerald’s misuse of his warehouse privileges and pays homage to the iconic key logo and tagline of Old Fitzgerald packaging that declares, "Your Key to Hospitality." 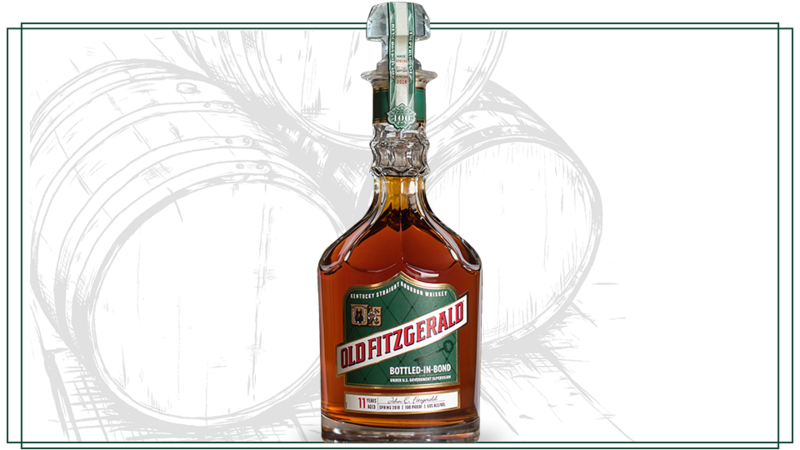 The Old Fitzgerald Bottled-in-Bond Series will be available in the 750ml decanter each spring and fall throughout the next five years. Each bottle will prominently feature the pre-Prohibition diagonal brand name, 1940’s era brand slogan declaring, "Your key to hospitality," the seal of the Commonwealth of Kentucky, and a tax strip across the stopper disclosing when the liquid was produced and bottled. Spring editions will be denoted with a green label; fall editions with a black label. 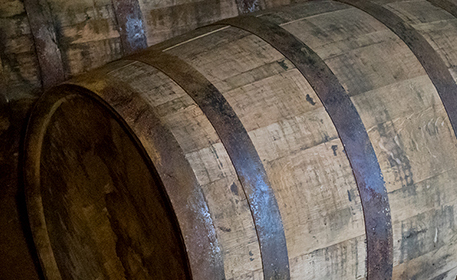 The ages of whiskey in each release will vary and be indicated at the bottom of the label. Prices for each release also will vary. 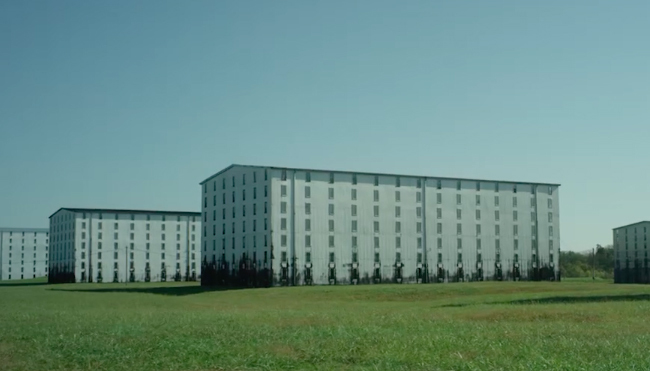 "For 82 years Heaven Hill Distillery has nurtured and produced historic brands of quality and heritage," said Heaven Hill Distillery Master Distiller Denny Potter, adding that the new release is non-chill filtered. "It is an honor to join a famous line of distillers behind the Old Fitzgerald name and to continue to uphold the tradition of the brand through its bottled-in-bond designation, which dates to the early 1900s." S.C. Herbst establishes the Old Judge Distillery Co.
Old Fitzgerald becomes a registered trademark. Julian P. Van Winkle (a.k.a. "Pappy") joins W.L. Weller, Whiskey Traders. 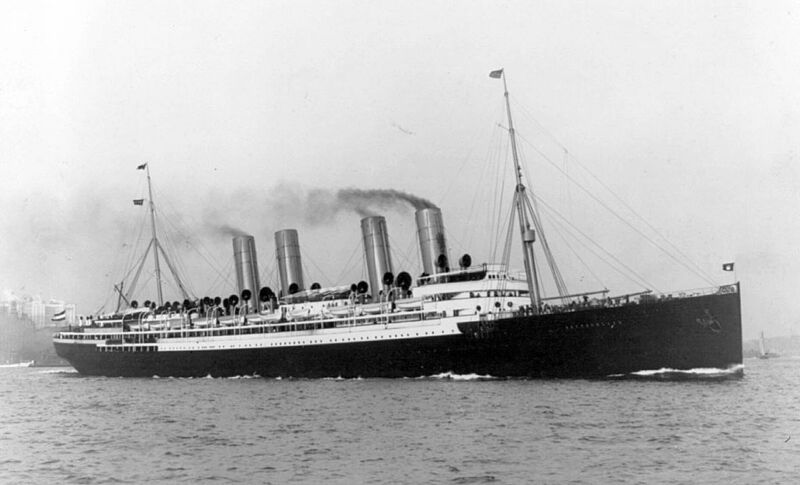 Old Fitzgerald® starts selling abroad, in Italy, Germany, France, and England. The John E. Fitzgerald Distillery Company erects a new "Bottling in Bond" plant for their European business. U.S. Congress passes the Volstead Act, establishing Prohibition. Old Fitzgerald® and A. Ph. Stitzel are among the few distilleries with a license to continue selling whiskey for medicinal purposes. Old Fitzgerald® Prime is born. 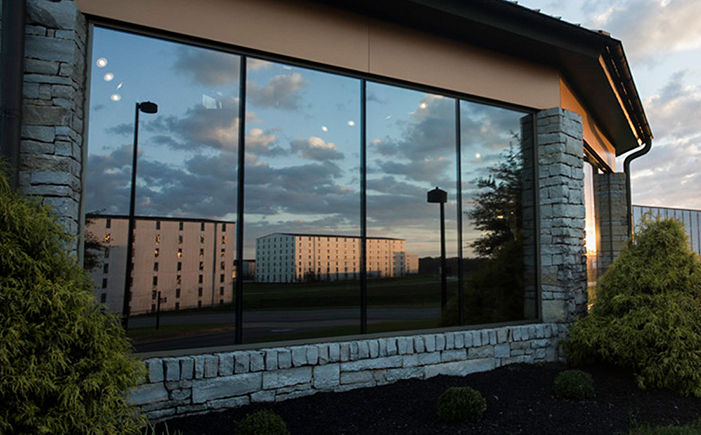 The 86.8 proof straight Bourbon is the first to not be bottled-in-bond. 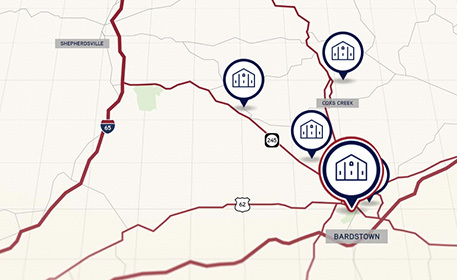 Old Fitzgerald® becomes property of Distillers Limited Co. of Scotland (DLC). 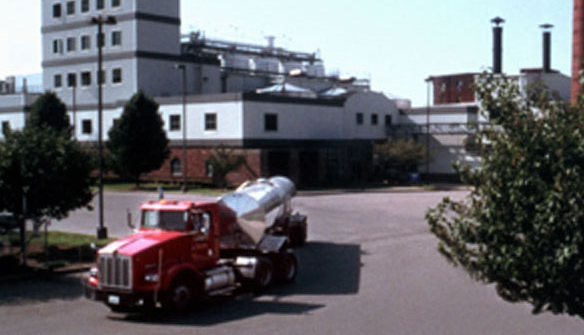 The Stitzel-Weller Distillery in Shively, KY closes. 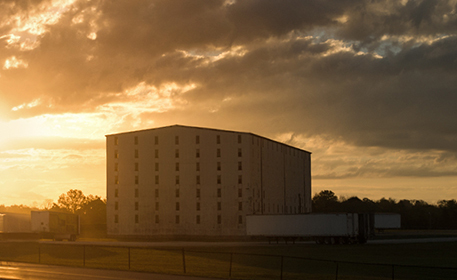 April 28 - Heaven Hill purchases the Bernheim Distillery from Diageo, which includes the Old Fitzgerald® brand. 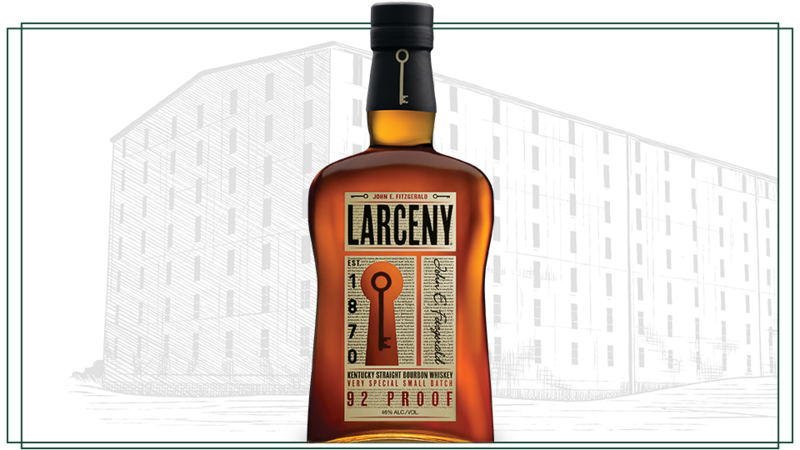 Heaven Hill introduces Larceny® Kentucky Straight Bourbon Whiskey in select markets. Its origin story reflects the long and colorful history of John E. Fitzgerald and the storied Old Fitzgerald® brand. John E. Fitzgerald builds a distillery in Frankfort, KY.
- Allegedly, his eponymous whiskey is sold exclusively to steamship lines and private clubs. Old Fitzgerald® hits the market. S. C. Herbst registers Benson Creek, John E. Fitzgerald, and Old Judge in the Wine and Spirits Bulletin. 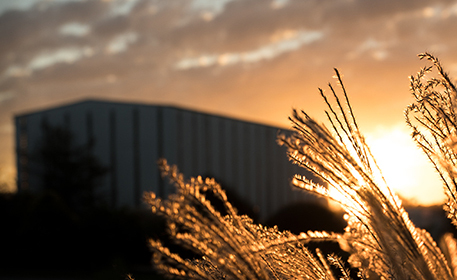 Pappy Van Winkle acquires controlling interest of W.L. Weller. Arthur Phillip Stitzel (A. Ph. Stitzel) buys the Stitzel Bros. Distillery for $25,000. W.L. Weller merges with A. Ph. Stitzel. Stitzel-Weller crafts their first decanter bottles. Norton-Simon Inc. purchases Stitzel-Weller, making it part of Somerset Imports. They rename it Old Fitzgerald®, in honor of the best-selling brand. DLC merges with Guinness to form United Distillers. 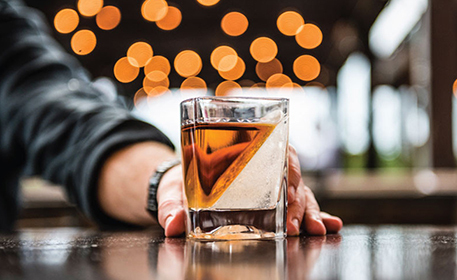 United Distillers rebrands Old Fitzgerald® back to Stitzel-Weller. The Bernheim Distillery opens in downtown Louisville. 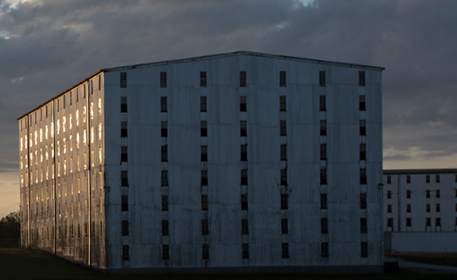 November 7 - Fire tears through the grounds of Heaven Hill, consuming the Bardstown distillery and seven rickhouses. 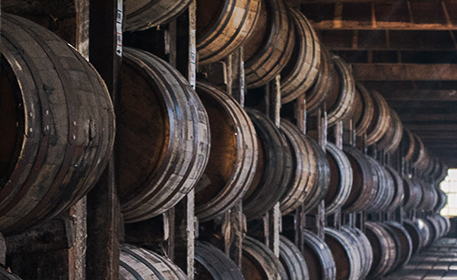 Approximately 90,000 barrels of Bourbon are destroyed. The barrel aging-process for Old Fitzgerald® Bottled-in-Bond Spring 2018 Edition begins. Heaven Hill releases John E. Fitzgerald Very Special Reserve, from 20-year-old barrels distilled at Stitzel-Weller. It wins Whisky Advocate's American Whiskey of the Year. 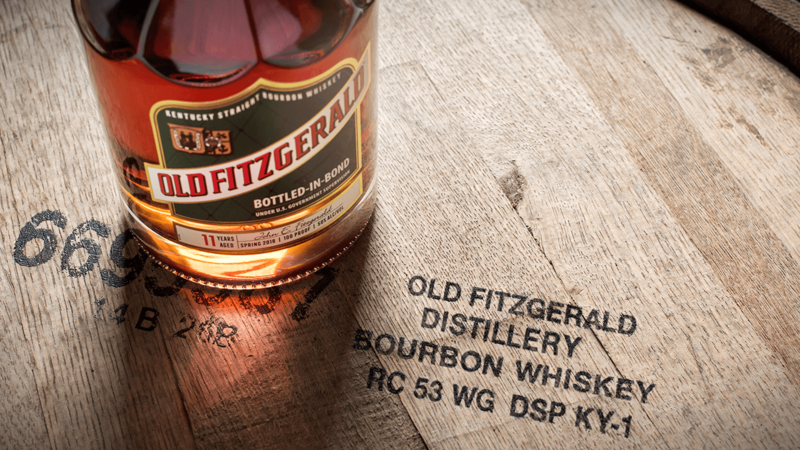 The first edition of the Old Fitzgerald® Bottled-in-Bond Series is released.